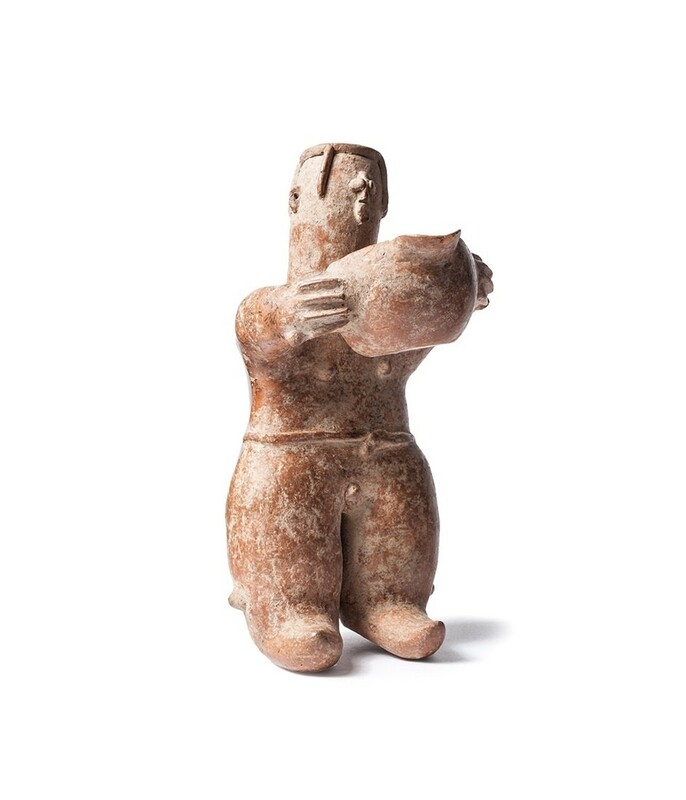 Amlash culture flourished in the fertile mountains of northern Iran in the first millennium B.C, leaving behind a distinctive and intriguing material culture that has come to light in recent decades, illuminating their civilisation. 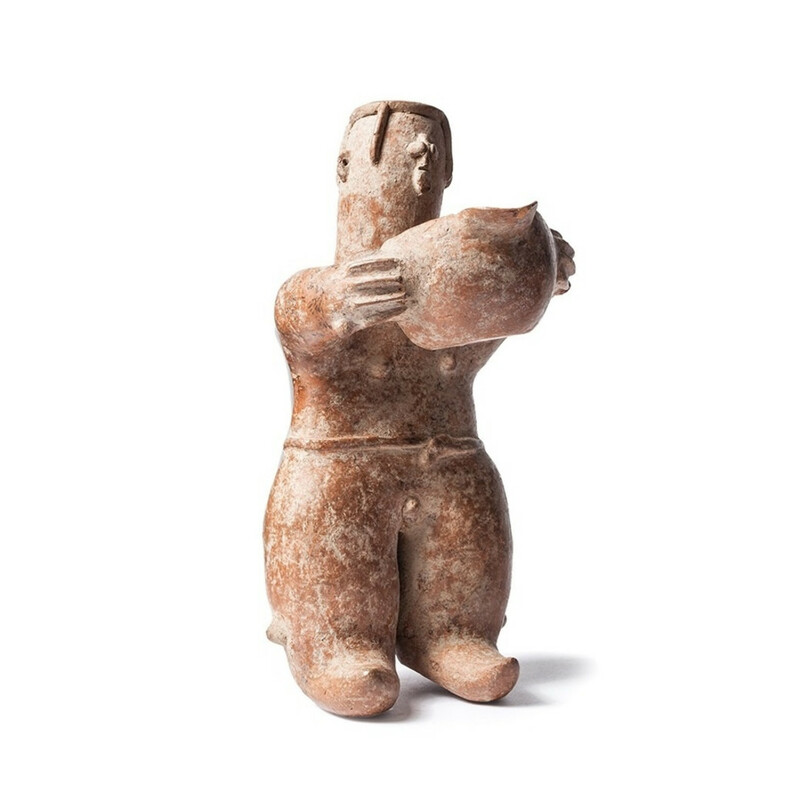 Spanning the modern day provinces of Gilan and Mazandaran, the Amlash culture produced an array of terracotta figurines, ranging from highly stylised, almost abstract votive idols, to zoomorphic libation vessels. Displaying a clear fascination with nature and themes of life, little is known of their religious customs, but a wealth of spiritual artefacts suggest it played a key role in their daily rituals. 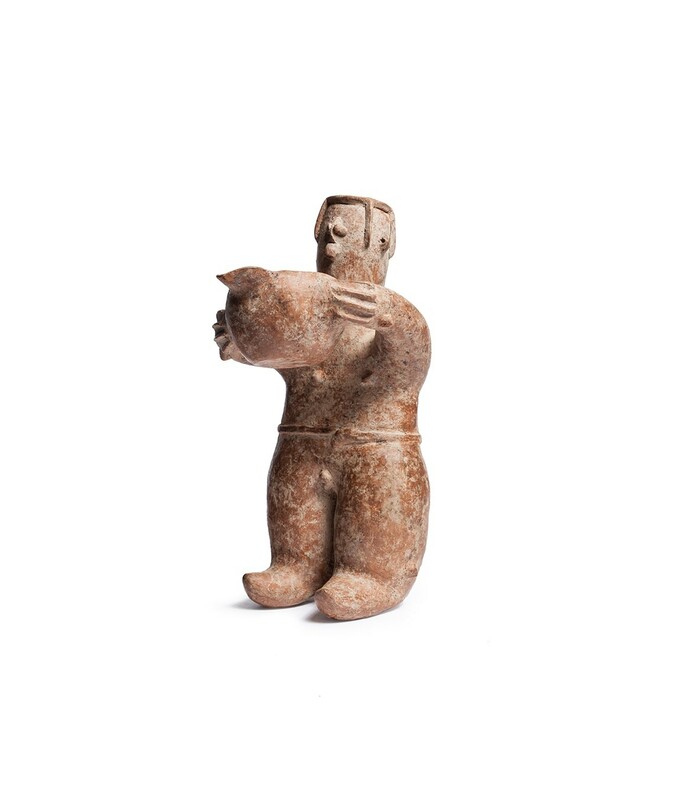 This museum quality figure is a superb example of highly stylised Amlash clay-work. An impressively large example surviving in excellent condition, the figure appears imbued with a celestial power. Larger figures were much more difficult to fire, meaning they needed great skill and care in their construction – only a highly versed artisan could make such an example as this. He holds at arm’s length a vessel in to which libations or offerings may have been placed, employing him as a tool with which one could communicate with the other world. 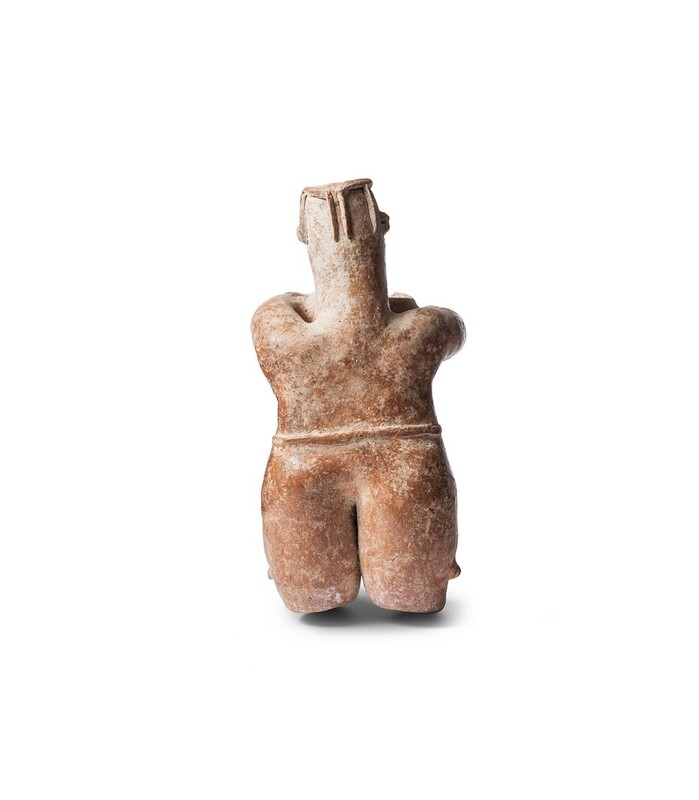 Charmingly simple in design, his eyes, ears and nose are all formed from small clay balls that have been attached, and his body is rendered in simple forms, working each limb down in to its simplest shape like an early form of the 20th century art movement Cubism. His pointed feet suggest a type of woollen boot, and the square shape of the crown of his head is suggestive of a ceremonial headdress – perhaps that of a priest. 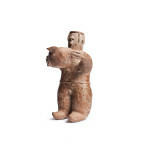 As a people leaving behind no evidence of writing, little is known of the Amlash culture, and archaeological evidence of statues, animal figurines, weapons and pottery is scant and often lacking context, leaving behind few clues of these elusive people. 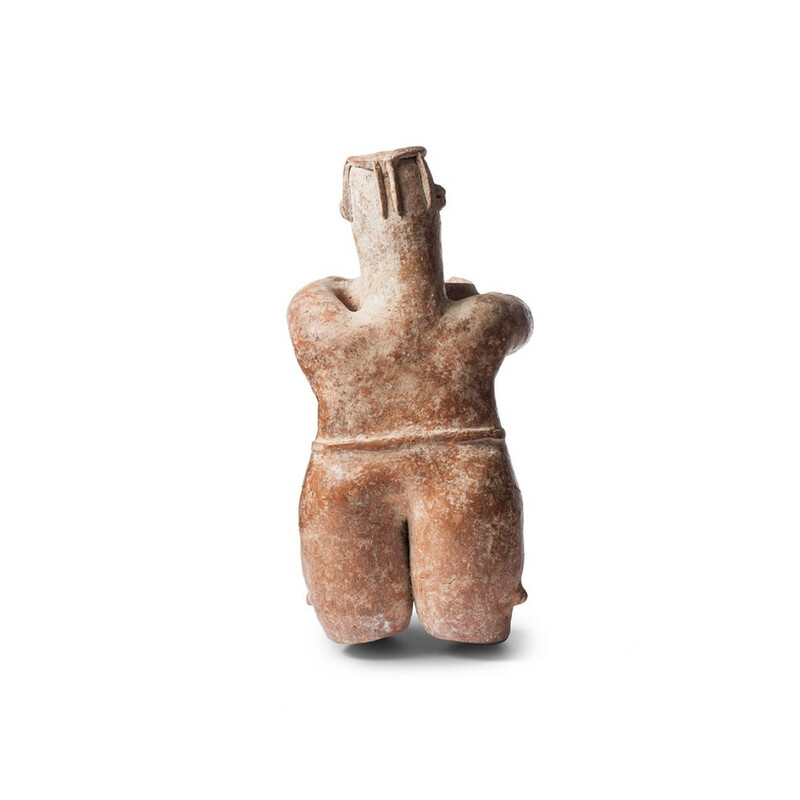 Therefore what we can summarise from objects such as this is highly important for our understanding of Amlash culture – they were clearly concerned with some form of supernatural power, had a social and religious hierarchy, and were skilled and creative artisans. Some terracotta artefacts have been found in grave burials, suggesting an association with death ritual, highlighting the importance of such objects for the Amlash people – perhaps this figure once graced the tomb of a deceased Amlash person of power, dedicated by their family. As a piece on insight in to their customs, this object is extremely valuable for the clues it presents. The Cleveland Museum of Art in Ohio, America, contains a similar Amlash figure, although slightly more anthropomorphised than this example. The Cleveland female figure is missing a libation bowl, which may or may not have originally been attached. Together the two display the variety in output of these artisans, and their creative energy employed in making such figures, of which no two are alike suggesting each was made for a specific purpose and a specific patron, to whom they were of both religious necessity and great importance as part of their spiritual culture. J. Gabus and R.L. Junod,; Amlash Art, Hallwag, 1967, p.5. With Aaron Gallery since the 1950s. Sotheby’s, ‘Antiquities’, 12th December 1983. Lot 49, catalogue pg. 13.